Once upon a time, Apple announced that it was going to release a cool new wireless charging pad and a wireless charging case for its wildly popular AirPods earphones. Yeah, that was over a year ago. Maybe those products will be released some day and maybe they won’t. All we can say for certain is that you don’t have to wait for either of them to add wireless charging capability to your AirPods. 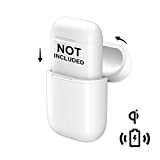 Just pick up a NeotrixQI Wireless Charging Case for Apple AirPods on Amazon for under $20, pop in the regular old AirPods case you have right now, and presto — your AirPods are instantly compatible with any wireless charging pad.